This week we decided to run a team game for something different. 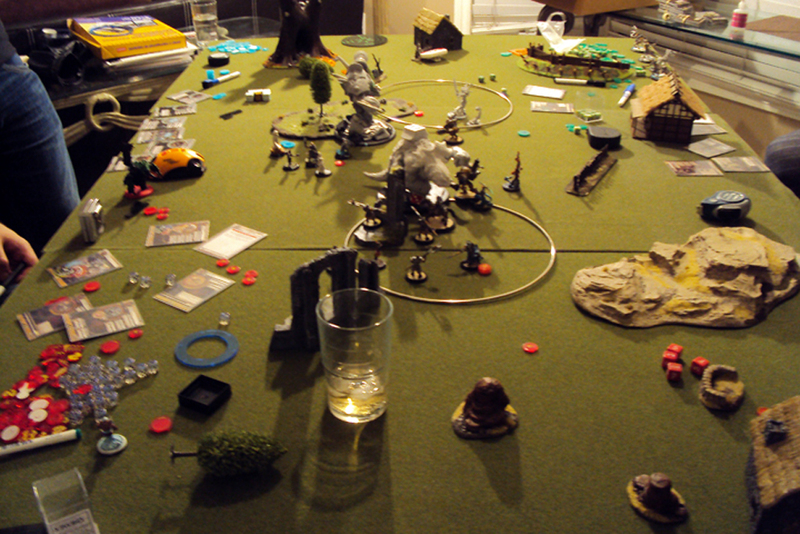 Aaron, Adam, Kassem and Myself participated in the battle. Everyone brought a 25 point list and then we rolled randomly to see who would be paired up. As always, you can listen to the podcast right here, or on iTunes at your preference. If you feel inclined to give us a rating on iTunes (and help Combo Smite become more widely listened to), that would be awesome and we would be grateful! This week’s game was chuck­full of action! Seriously. There was no more room left in that chuck for anything. Had we attempted to add even a thimble of more action to that chuck it surely would have hemorrhaged causing massive internal injuries as bacteria rich bile seaped into the surrounding organs. A chuck is an organ, right? One that doesn’t really do anything? After some light research I’ve discovered “chuck­full” is actually the modern english version of “choke­full”: a person or thing stuffed nearly to the point of choking. I’m sort of surprised that it has its origins in reference to something nearly choking. I thought it would be referring to a chuck wagon that you would affectionately call ‘The Chuck’ if you worked with it everyday as in, “Go down to the barn and grab the chuck to take these crates of bacteria rich bile into market.” I don’t know what a chuck wagon is either. Oh, it’s like a covered wagon. The ones that settlers used to travel west across Canada and the United States. Regardless, if this game had been a living thing and we tried to fit any more action down its throat, it would have vomited bacteria rich bile all over itself. We decided to try out a 2 vs 2 match in the hopes that we could do it in a reasonable amount of time. Our other two attempts ended badly: both ran way too long and one we just stopped playing because it was so late and an argument erupted about something or rather. To increase the chances we would finish that game at all let alone enjoy it, the turns were 5min with one 3min overage per player (on our second round we changed it to 6min) and the list size was only 25 points. 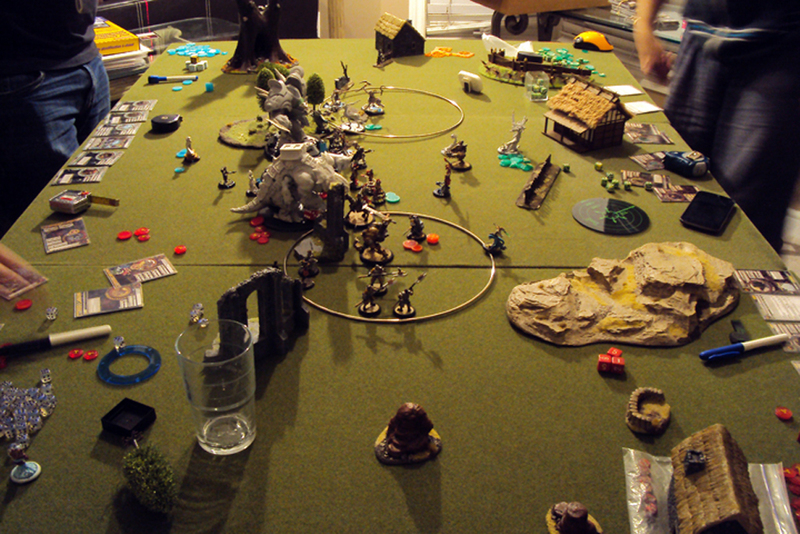 We rolled to see who the teams would be and after a bunch of re­rolls we determined the teams to be Retribution and Skorne (Team Interloper) vs Mercenaries and Cryx (Team Valkyrie). 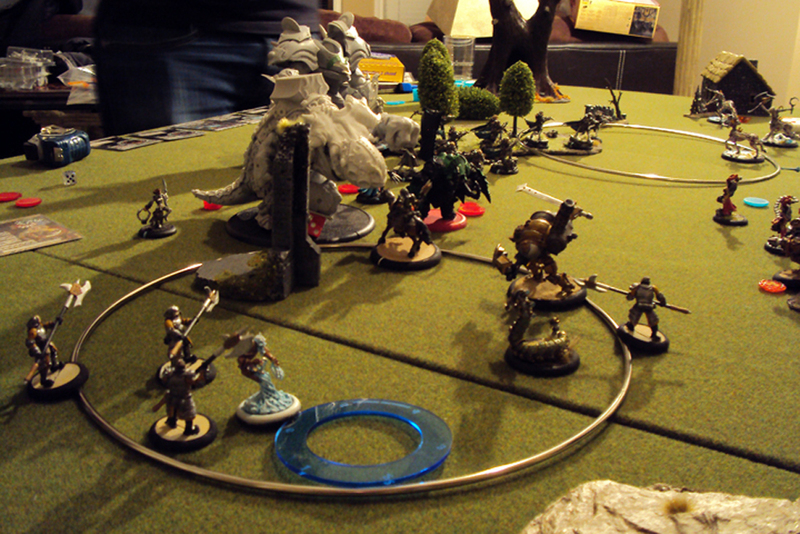 The scenario that we played was a modified version of Outflank: two 12″ zones placed 24″ from the deployment zones, one 14″ from the left edge and one 14″ from the right edge. Since there were 4 casters (3 casters and 1 warlock, technically) we adjusted the zone control points to 10 for the win instead of 5. 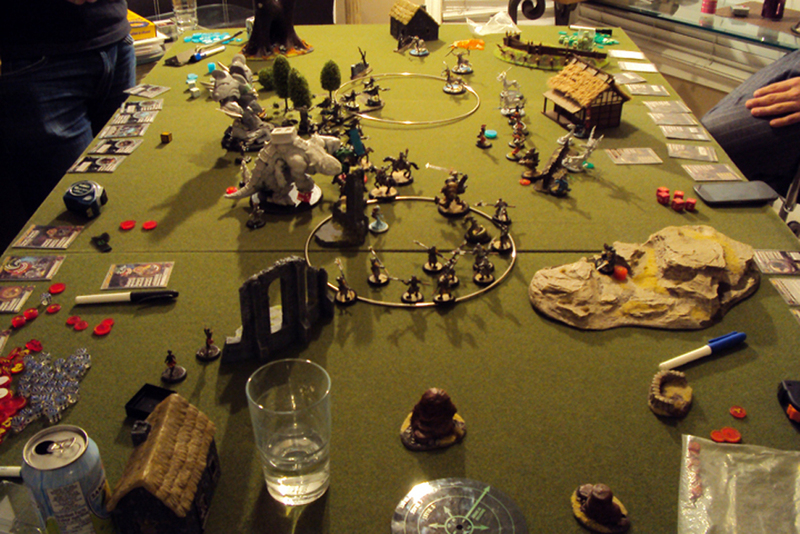 Adam and I won the turn order dice roll and chose to go first however since it was 2 on 2 player order went Mercs, Skorne, Cryx, Retribution. 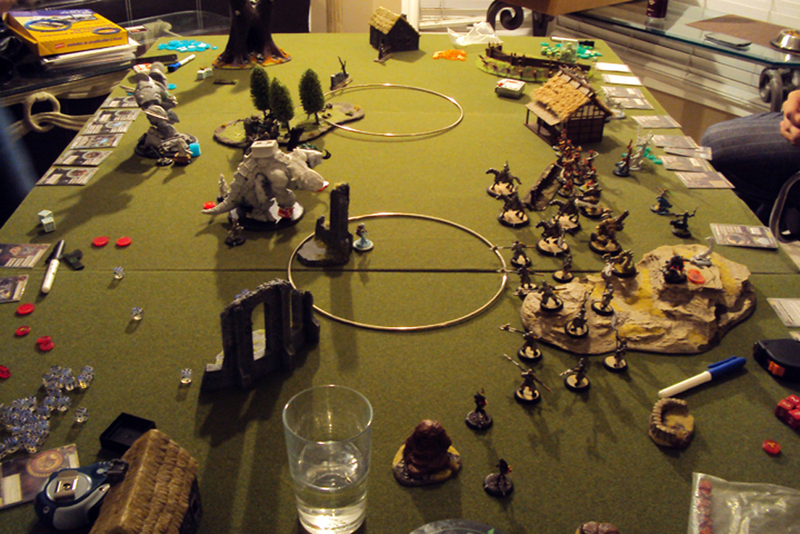 Nick brought a 25 point Issyria list which was focused on Hyperion and getting to fire off 2 Sparkleburst cannon shots each turn. 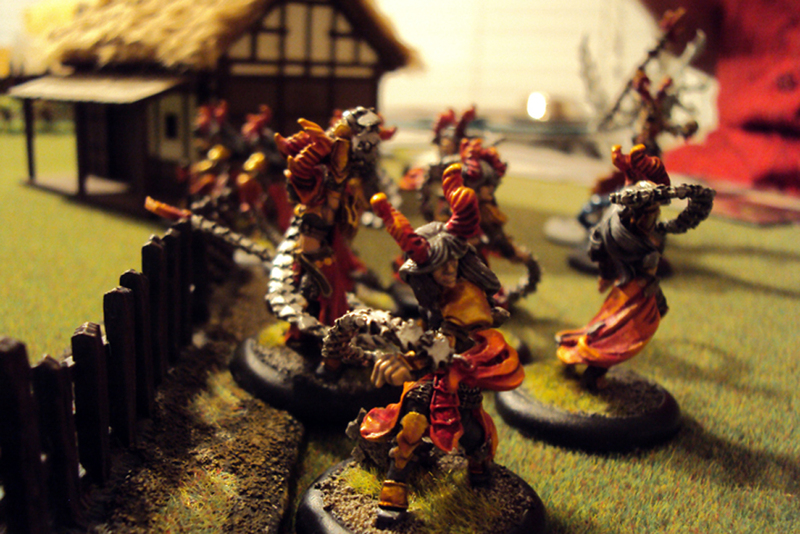 Nick was paired up with Kassem who was rocking his Skorne tonight. 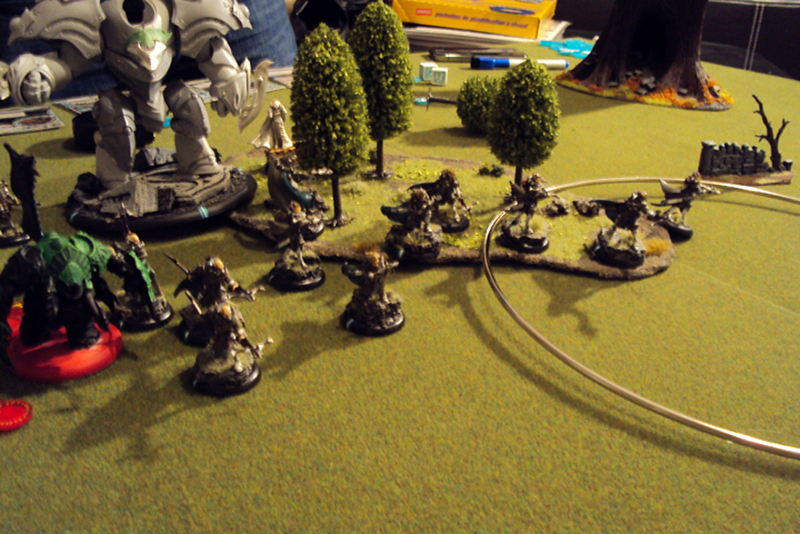 He had just picked up a big lot of used Skorne models so it looks like he won’t be needing to proxy much any more. 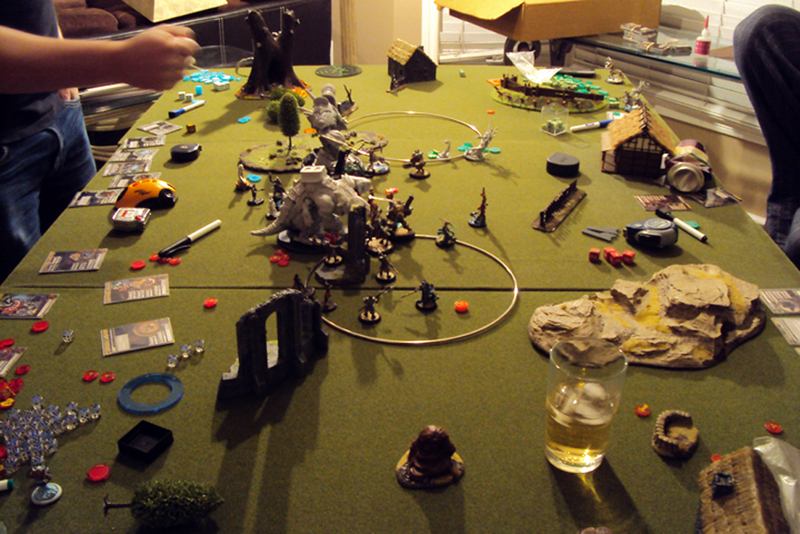 I was paired up with Adam playing Cryx. Kassem and I pre-deployed our Huge bases to the left and right of center. 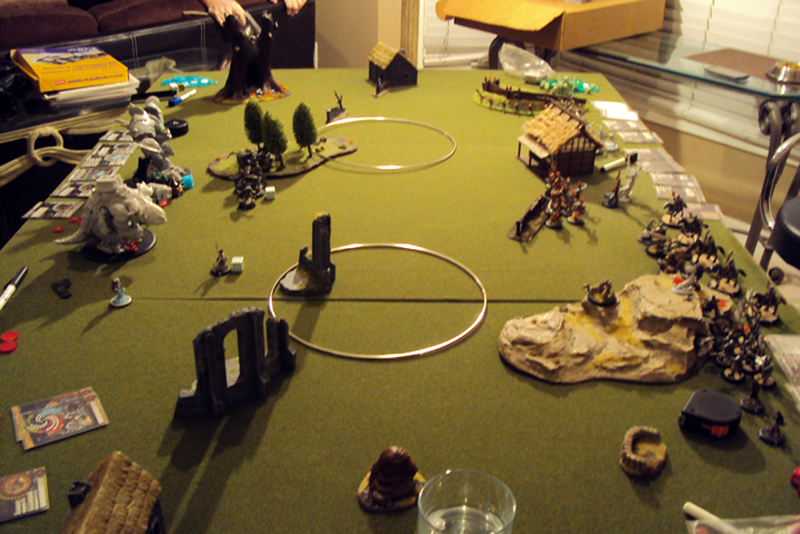 Aaron deployed first in turn order He put his Cavalry and Battle group near the center of the table and Magnus and the Halberdiers to their left. 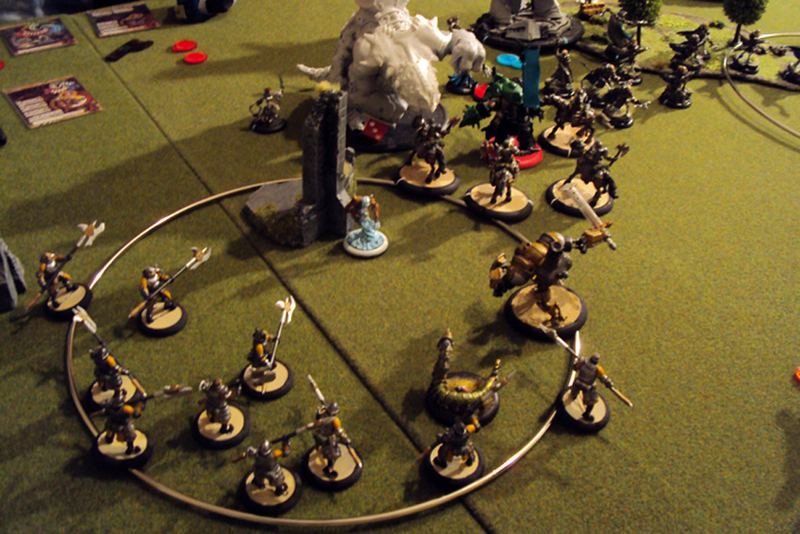 Kassem deployed his remaining models around his Mammoth. 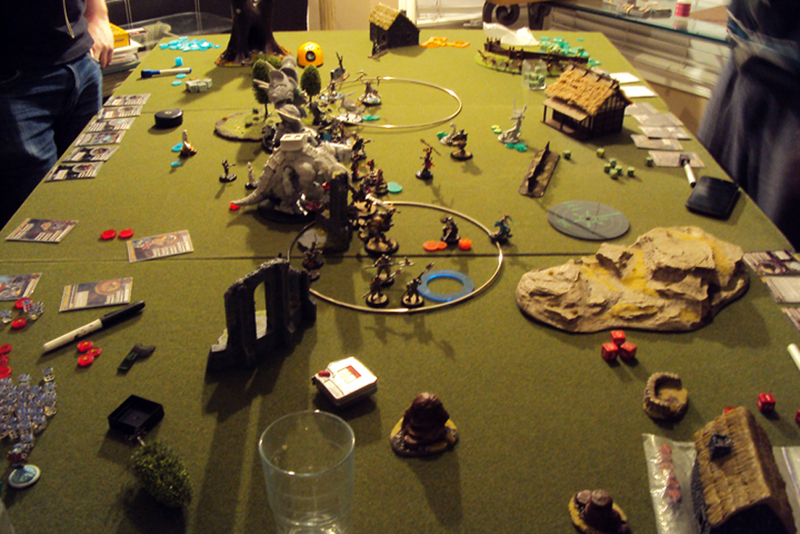 Adam deployed his Soulhunters on the right flank and his Raiders in the middle of the table with the Warwitch Siren and Pistol Wraith. 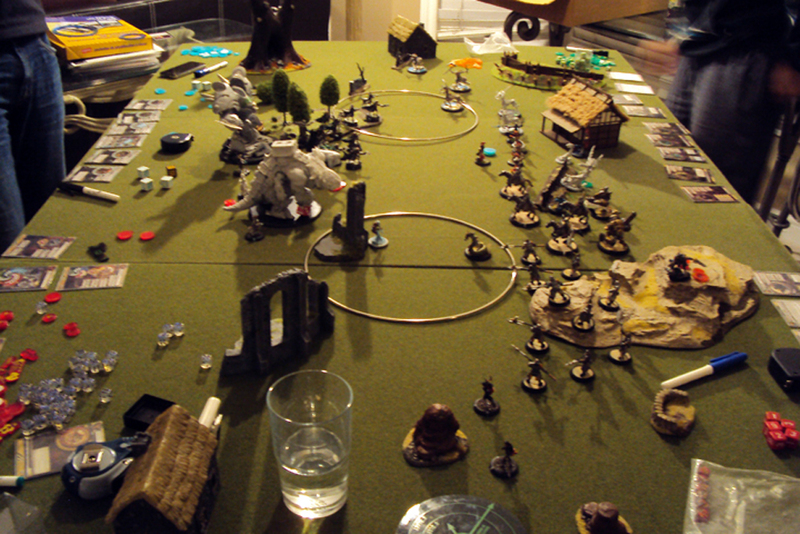 I deployed my Strikeforce in the forest in front of Hyperion, Issyria and the Arcanist beside him and my Assassin I deployed on Kassem’s side of the board to ensure that I would forget to activate her every turn. With that we are ready for a brawl. 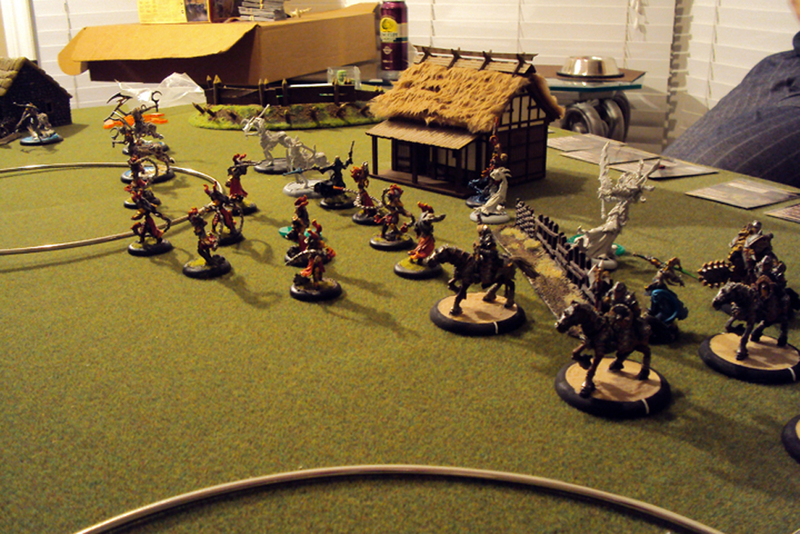 Mercs Turn 1 – Kayazay run forward. – Since Aaron forgot to assign focus the Nomad and Renegade just advance forward. 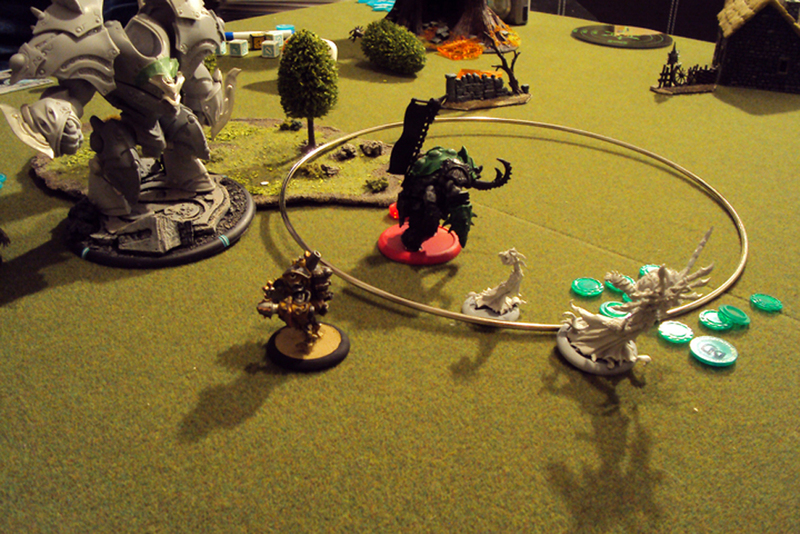 – Morghoul casts abuse on mammoth, walks up, casts admonition on gladiator and takes a fury off gladiator. 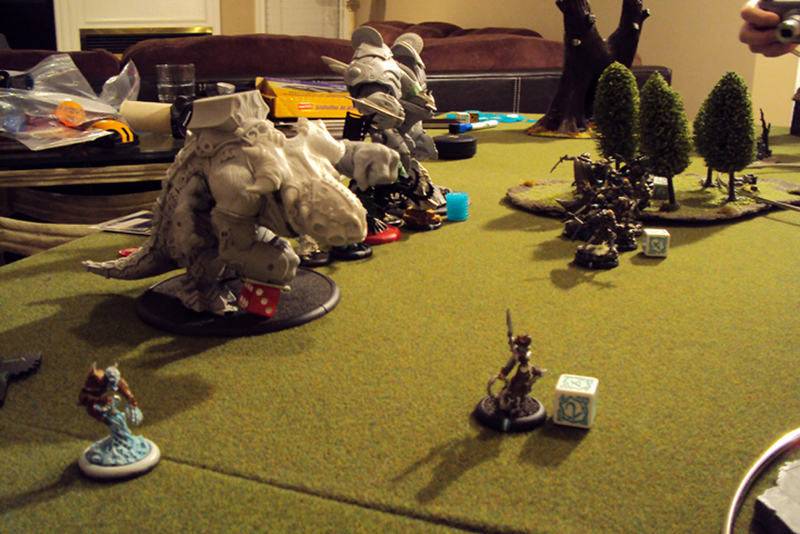 – Mammoth walks up, takes a shot at a Steelhead Halberdier. And kills a few. Takes 2 more shots with bad deviations. 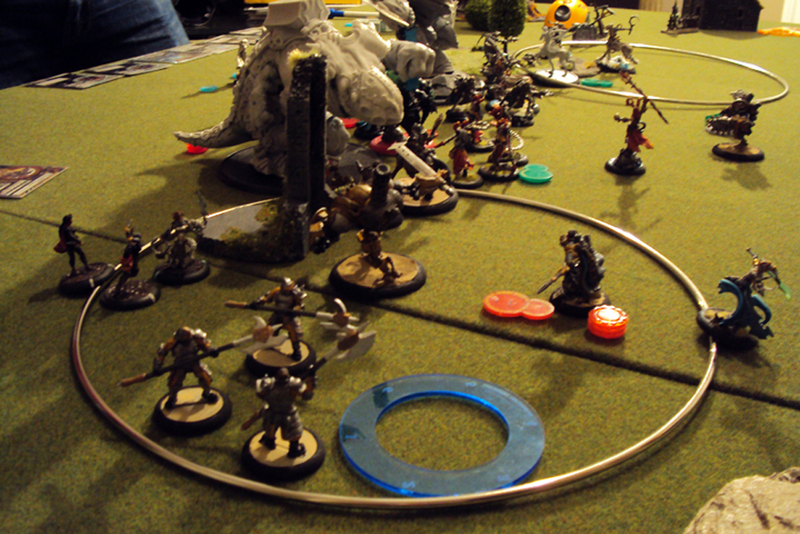 -wilbreaker advances up, and does ancillary on mammoth to make him shoot again. Bad deviation. 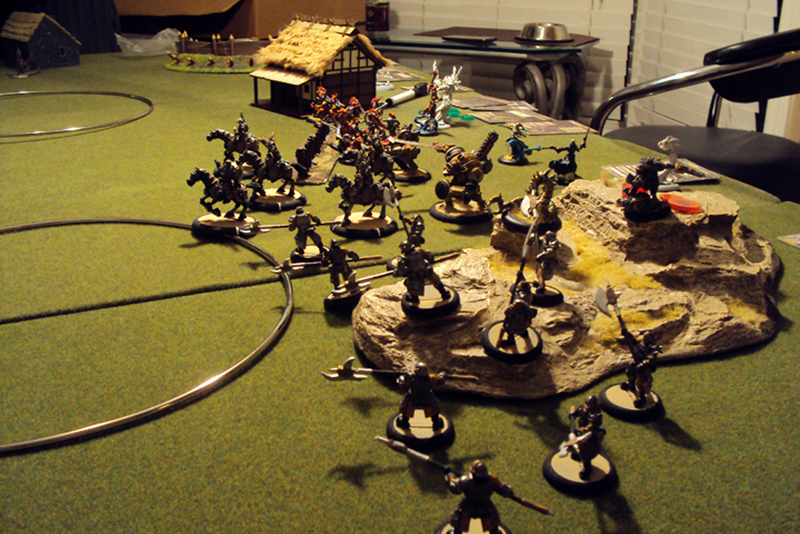 – Soulhunters spread out far away on their right flank. 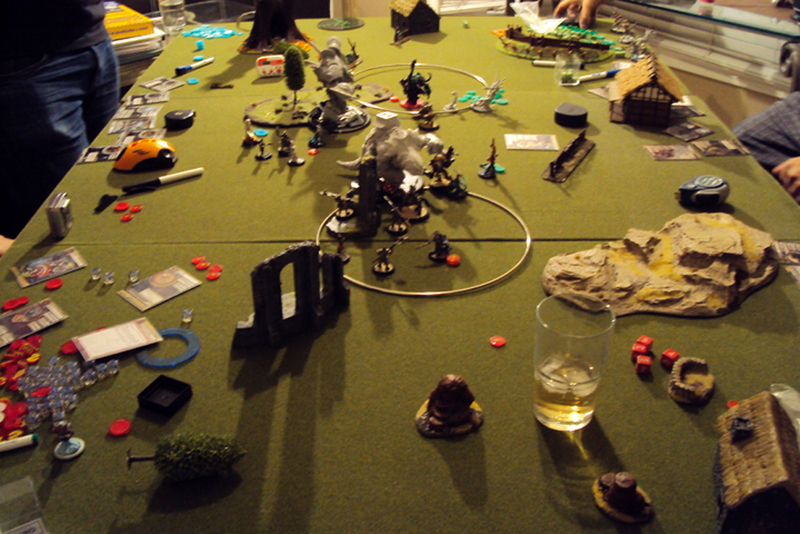 – Pistol Wraith run across the table. -Issyria moves up, puts IR on Hyperion and blinding lights the Raiders, pops her feat and velocities to the safety of the forest. -MHSF moves up and kill 5 of the Raiders. 8’s to hit are hard even with Issyria’s feat up. 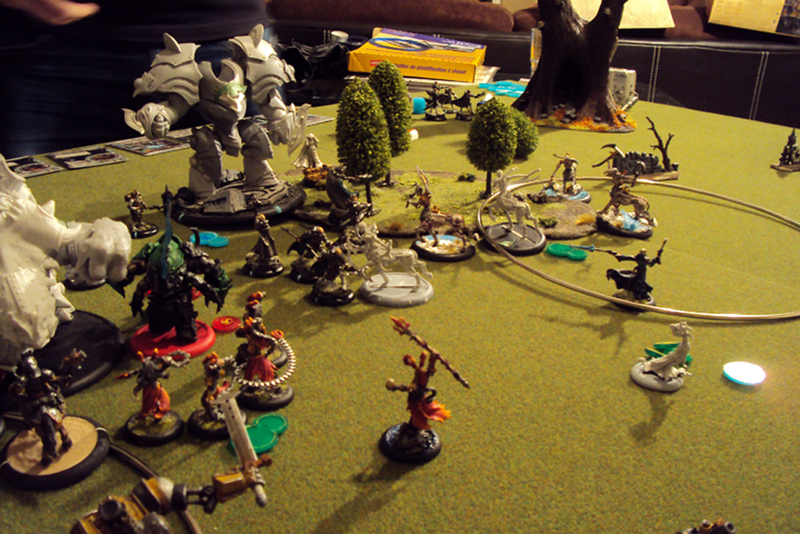 -Hyperion moves up and kills another Raider. Nothing else in range. -I run out of time before I can activate my assassin. 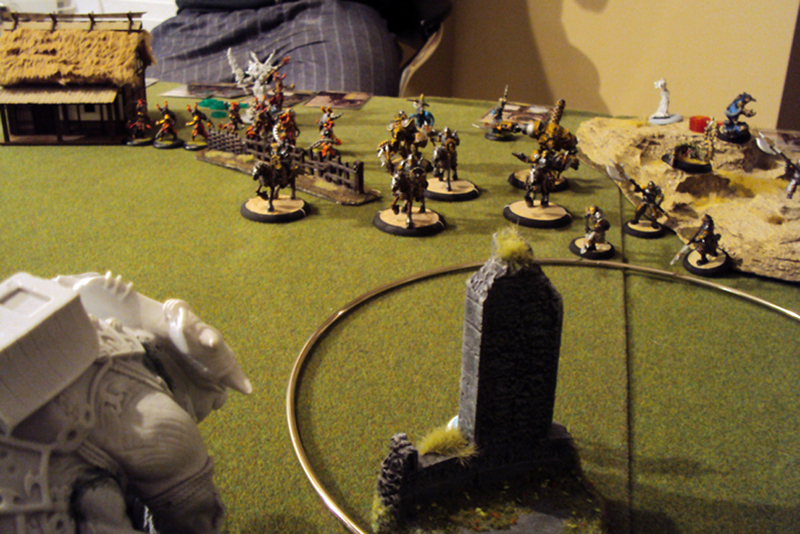 -Willbreaker does ancillary attack on gladiator and he kills a cavalry model. 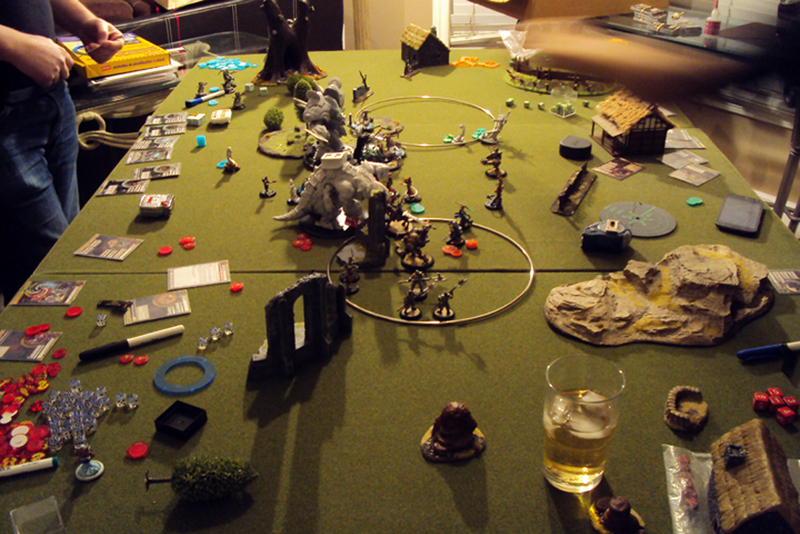 -Gladiator activates and kills 3 more cavalry. -Void spirit charges and kills a few halberdiers. 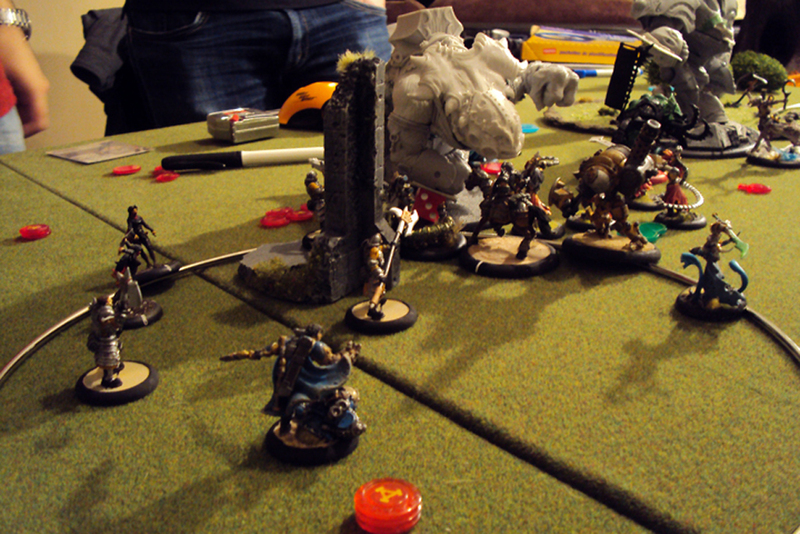 -Mammoth shoots and kills some more halberdiers. -Morghoul casts admonition on gladiator, counter blast on mammoth, and sheds one fury after tormenting mammoth and then pops his feat. 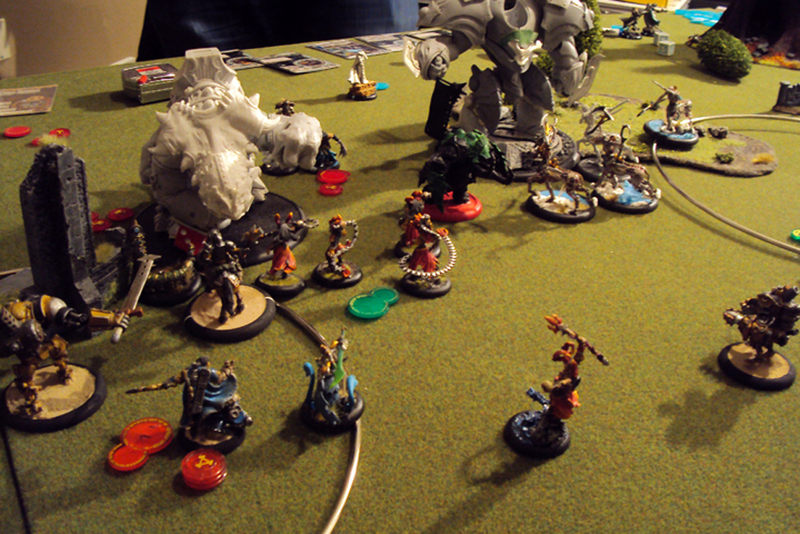 -Gaspy puts up carnage, hex blasts IR off Hyperion and feats. -Soulhunters charge MHSFK and kill about 6 of them. Giving Vociferon 3 souls. 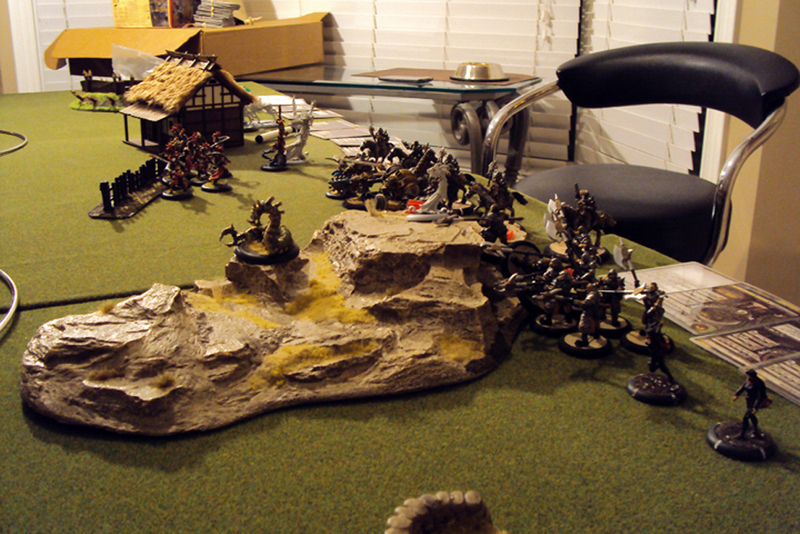 -Raiders charge the Gladiator but he admonitions out of melee with all but 2 of them who fail to wound him. 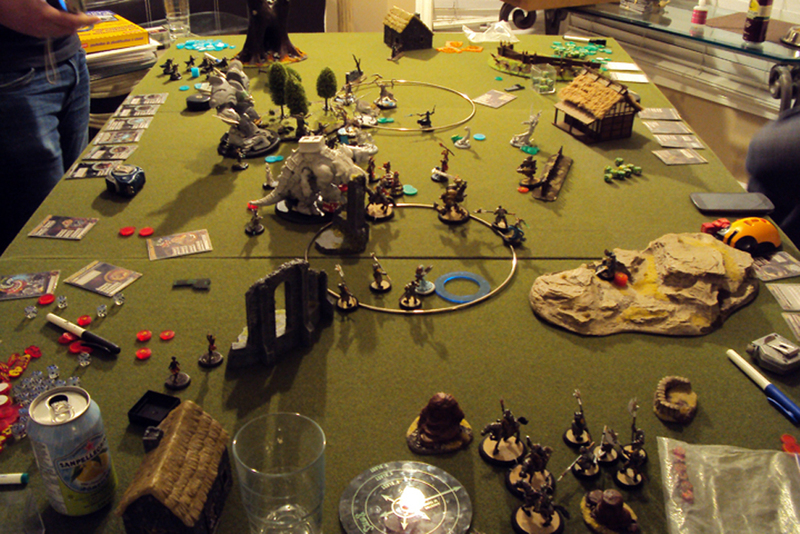 -Pistol Wraith moves up and fires on Hyperion but is out of range. 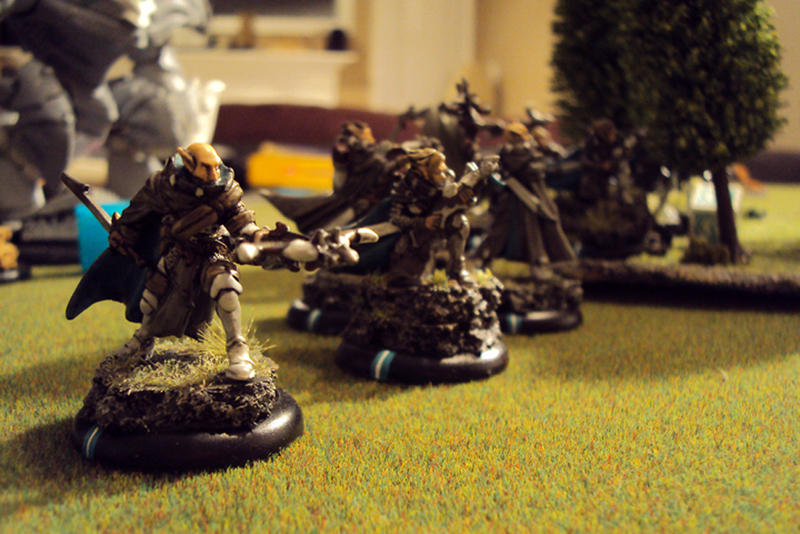 – Strike force do 2 CMAs on soulhunter but fail to kill. 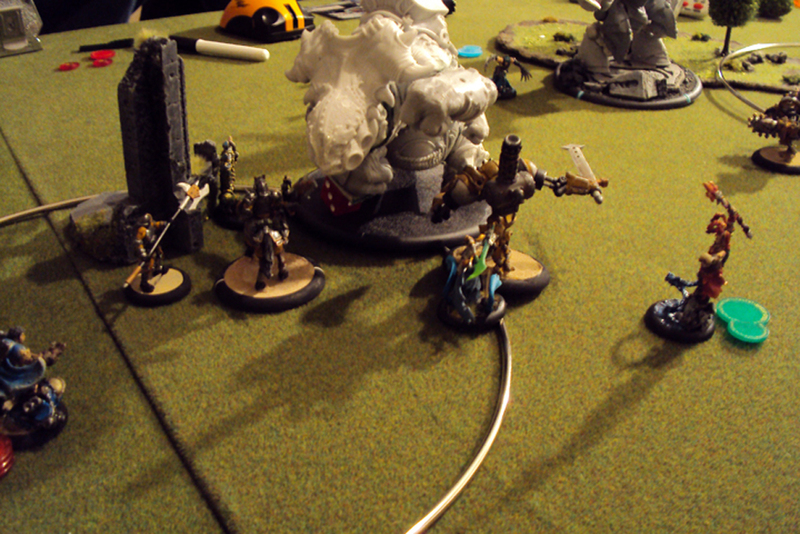 The other one aims and kills the Pistol Wraith. 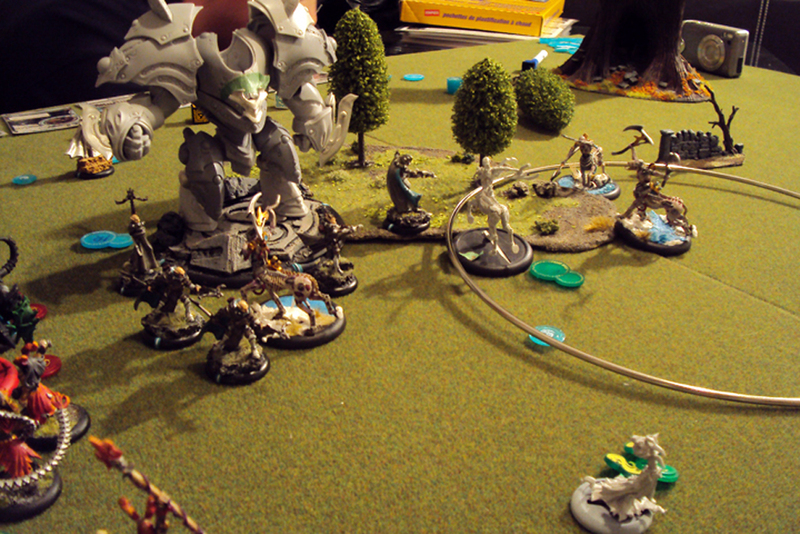 – Hyperion moves up and fired his guns into melee. Killed 1 soulhunter. 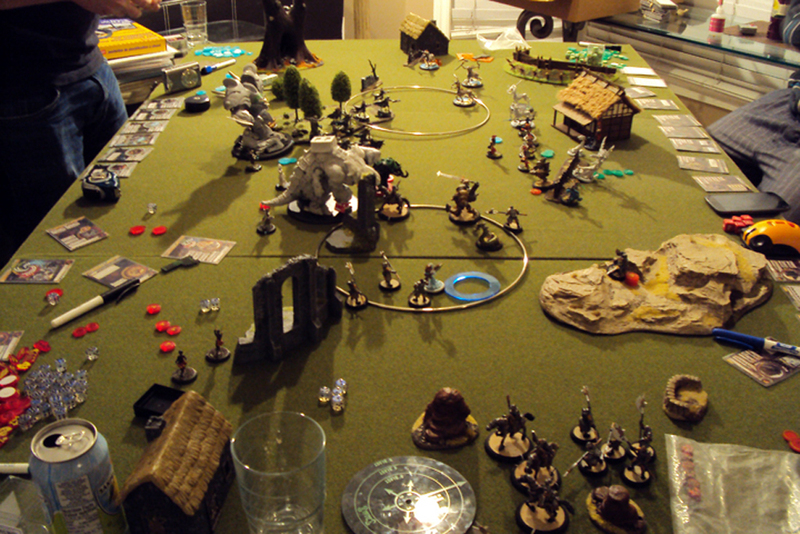 He fires his Sparkleburst cannon at Vociferon and fails to kill him needing a 6 to kill. Boo! 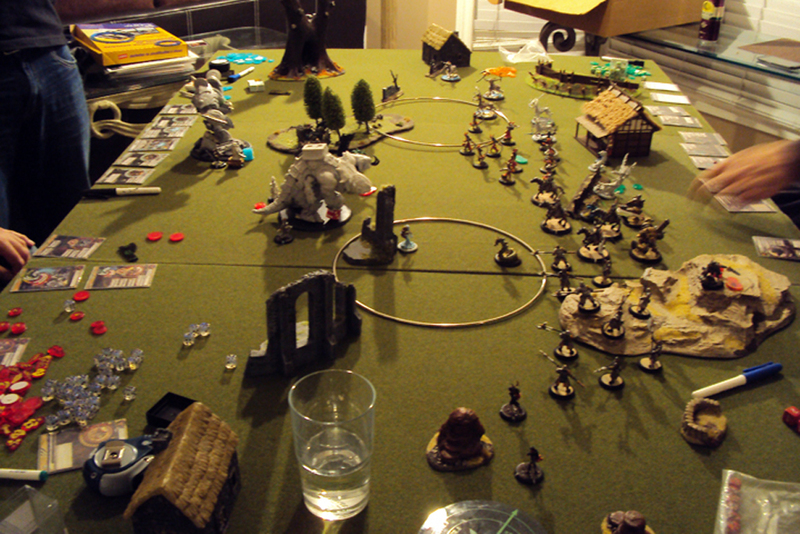 -Mammoth tries to shoot magnus but misses even with puppet master. 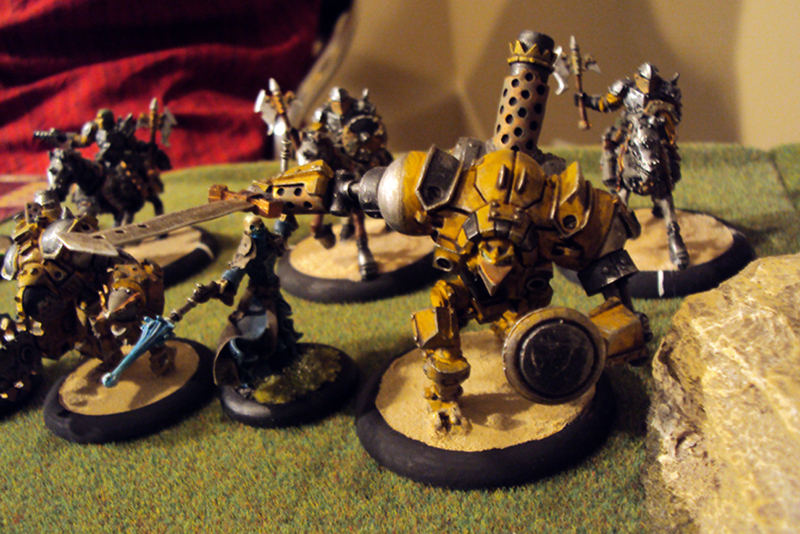 Magnus bullet dodgers away out of range. He takes a couple more shots at things in melee with him and does light damage. -Gladiator does nothing because of the feat. -Morghoul puts admonition on himself. -Soulhunters charge. They kill 4 more MHSF and do light damage to Hyperion. 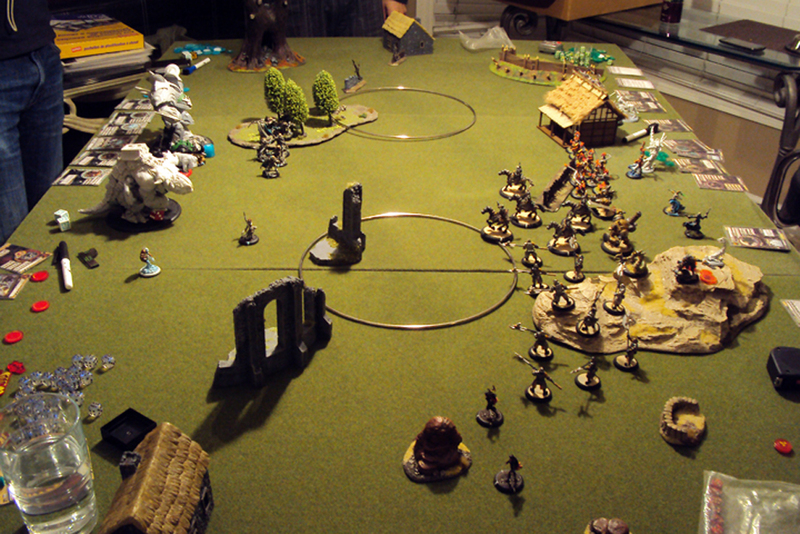 – Issyria moves up and Anciliaries a Soulhunter to death. – Hyerion kills 2 more Soulhunter with melee attacks but I forget to get him into the zone. 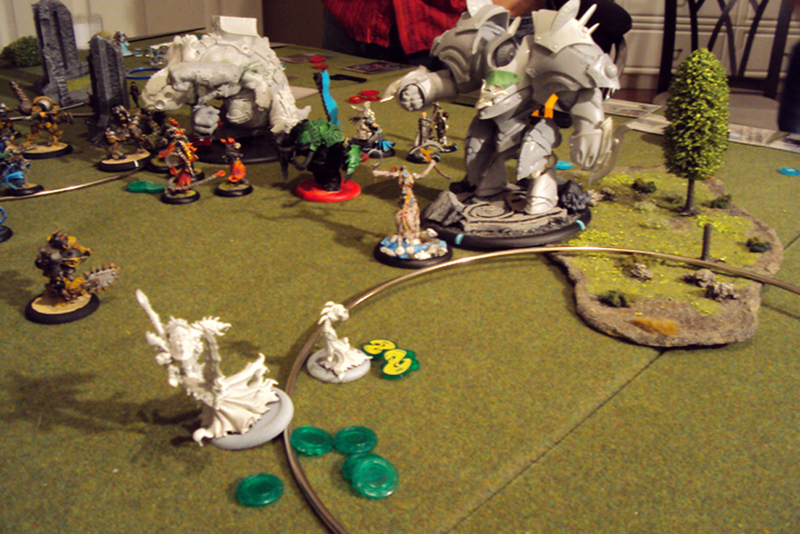 -mammoth bulldozes some models and gets into the zone to contest it. 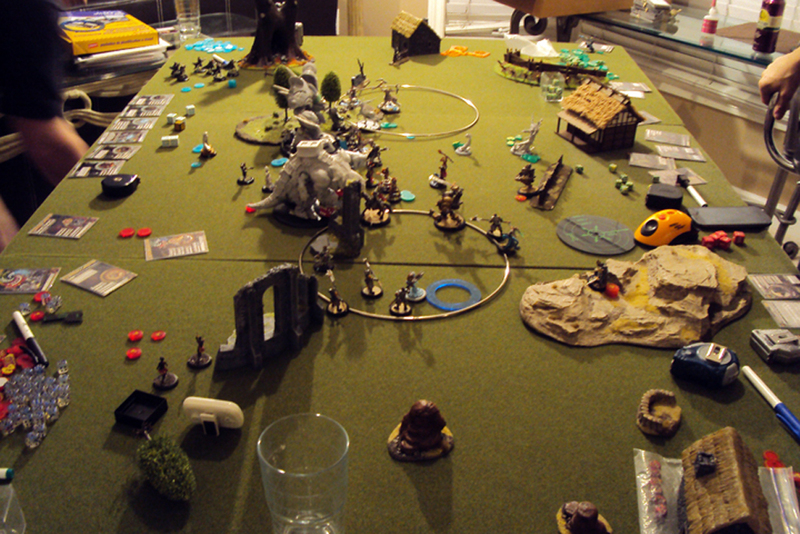 -Gaspy charges the Gladiator and kills it to win on Scenario. So Team Valkyrie pulls out a scenario win after having thrown away most of its army; the battle field reeking of the newly dead and newly re-dead. 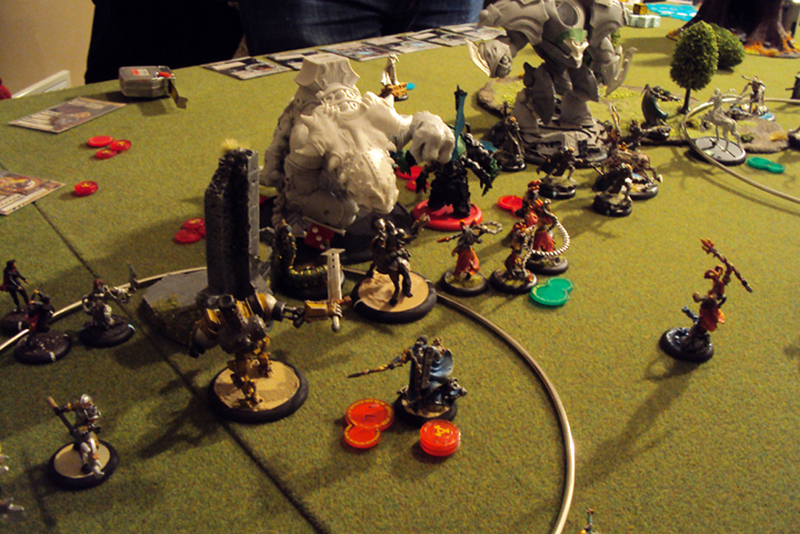 It was definitely a risky move for Team Interloper to each bring a colossal in a 25 point game just because of lack of attacks however having faced them seemed insurmountable. 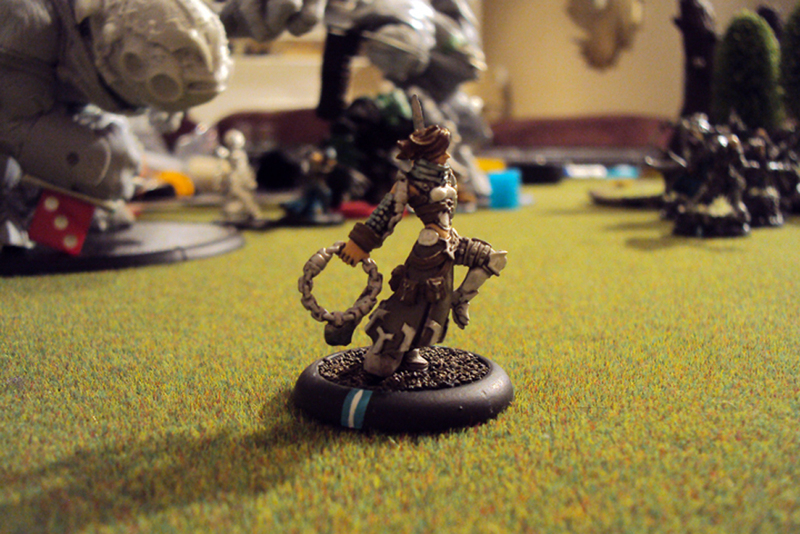 This entry was posted in Asphyxious, Battle Reports, Cryx, Issyria, Magnus, Morghoul, Podcasts, Retribution, Skorne and tagged batreps, Gaspy, Hordes, Mercenaries, Scyrah, Skorne Retribution, WarMachine by Aaron. Bookmark the permalink. Team Interloper? Team Valkyrie? I don’t get it. It’s almost as if the original write up was replaced with the current one. Apparently, Nick was a bit rushed when he did this write up and only “borrowed” part of your full write up for it. He has been flogged as a result. Thankfully, he has some time these days, and hopefully he can spend a little bit of it to polish up the write up here… I too was wondering where the “Interloper” and “Valkyrie” comments came from! I went back and added your original description. Now there won’t be any confusion! Well, other than the fact that “I” in the first few paragraphs refers to “Aaron”, and then around the underlined “Deployment”, magically “I” because “Nick”. Gong show! Gong show. Gods, who edits this website! ?